Attention, carnivores! Want to know where you can get the juiciest, most delectable burgers? Look no further than these five poolside eateries that are doing the all-American favorite justice. We’re talking about freshly ground meat grilled to order and piled high with all the fixin’s. Oh, and did we mention that they won’t cost you one extra penny? 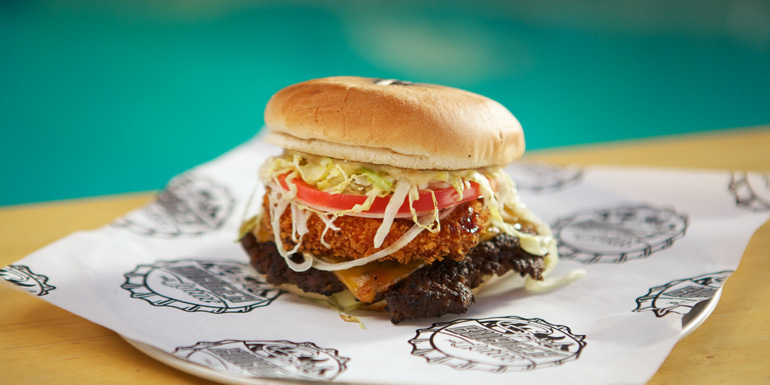 A recent addition to seven Carnival ships, Guy’s Burger Joint is quickly becoming a popular spot to chow down on the lido deck. 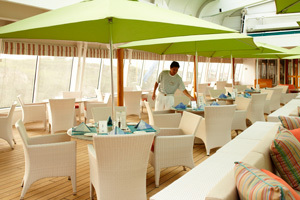 We can see why: The beef is ground fresh onboard, and the buttery grilled buns are baked in-house. You may need a little help deciphering the topping selections, however. Here’s a primer: S.M.C. stands for super melty cheese; a rojo ring is a spicy onion ring; L.T.O.P. stands for lettuce, tomato, onion, and pickle; and donkey sauce is Guy’s not-so-secret mayo dressing with Worcestershire sauce, roasted garlic, and mustard. 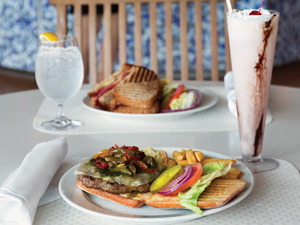 This eatery's menu features four different burgers: the Classic, which is topped with American or Swiss cheese; the Texan, with cheddar cheese, grilled onions, bacon, and a bourbon BBQ sauce; the Swiss, topped with Swiss cheese and garlicky sautéed mushrooms; and the Romano, capped with provolone cheese, roasted bell peppers, and pesto and served on ciabatta bread. These are all made of Black Angus but, for for an even more decadent feast, order the Kobe burger, made with Wagyu and dressed in a decedent black truffle sauce. Waves also has salmon burgers with bearnaise tartar sauce and spicy cole slaw, as well as ahi tuna marinated in soy and ginger and served with a dollop of wasabi-garlic mayo. 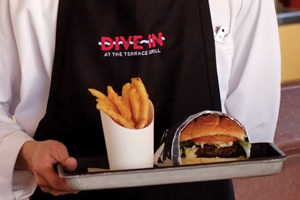 Holland America is switching out its Terrace Grill concept for the Dive-In at the Terrace Grill, which is all about made-to-order gourmet burgers and hot dogs. The burger patties are hand-formed before being grilled and loaded with your choice of lettuce, tomato, crispy onion straws, Gouda cheese, applewood-smoked bacon, caramelized onions, and Dive-In Sauce, which rumor has it is a blend of mayo, mustard, ketchup, and relish. Topside Restaurant puts an interesting spin on the classic burger with its Wild Dream burger, made with equal parts wild boar and beef, seasoned with fresh herbs, chopped cornichons, and hot pepper sauce. The Wild Dream is also topped with bacon and served on a homemade sesame brioche bun. This laid-back lunch spot grills up hot dogs, chicken burgers, veggie burgers, and — of course — thick, juicy, all-beef hamburgers. 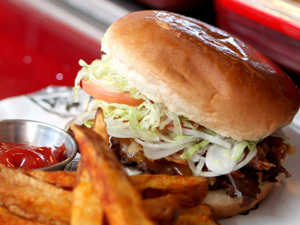 They’re served on homemade brioche buns with your choice of regular or sweet potato fries. 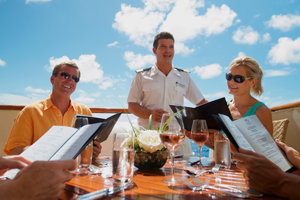 The alternative to Trident on Crystal Serenity is Tastes: It’s just as casual but has a tapas-style menu with Wagyu sliders topped with grilled onions and pickles and served on toasted buns. What do you like to top your burger with?